On this page you will find all news and updates concerning the ApiViewer. Jump to the german translation. Below the the most important alterations are documented. Here you can determine wether you are using an up to date version or if updates are available. If you work a lot with the Windows API you may have noticed that the win32api.txt text file distributed with VB is completely out of date. This file is based on Windows 95 header files. Lots of new library function have been introduced with Windows 98, Windows 2000, Windows ME, and Windows XP. If you want to use these functions you can search the internet for their declaration. This takes a lot of time and and may even be unsuccessful. 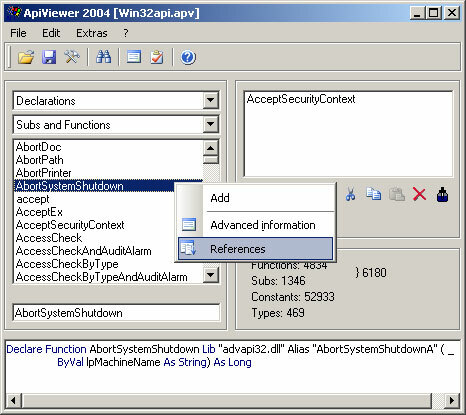 For that purpose we have developed ApiViewer 2004, which is meant to replace the Microsoft API viewer utility. The database contains the most up to-date declarations taken from the most current Windows XP header files: 6 500 declarations for functions and 55 000 constants. In contrast to this win32api.txt contains only 1 500 declarations for functions and 5 000 constants. So why not simply release a new version of win32api.txt? Maybe you don’t believe it but the Microsoft API viewer utilitycrashes with an overflow error when trying to load the new version of the file.